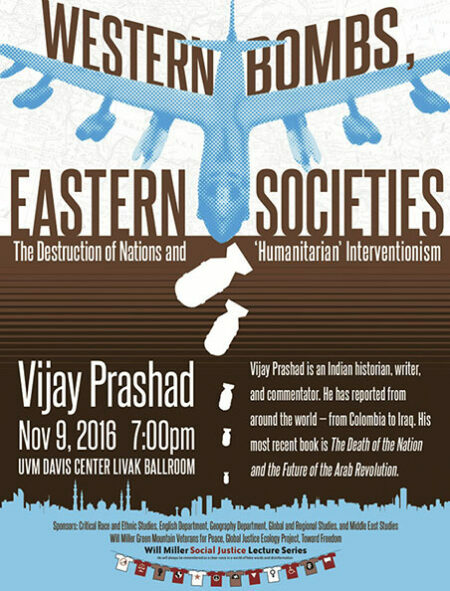 Vijay Prashad is an Indian historian, writer, and commentator. He has reported from around the world — from Colombia to Iraq. His most recent book is The Death of the Nation and the Future of the Arab Revolution. Sponsors: English and Geography Departments, Critical Race and Ethnic Studies, Global and Regional Studies, Middle East Studies, United Academics, International Socialist Organization Burlington Chapter, ?Global Justice Ecology Project, Will Miller Green Mountain Veterans for Peace, Toward Freedom? This entry was posted on Wednesday, October 26th, 2016 at 6:48 am	and is filed under Previous Events. You can follow any responses to this entry through the RSS 2.0 feed. Both comments and pings are currently closed.